Over the years, I’ve built my own model to identify the best dividend paying companies. The core of my investment strategy has been built around dividend growth. Overtime, I didn’t want to limit myself among a short list of 19 or 51 companies and rather starting the study of a wider group; the achievers. The Dividend Achievers Index refers to all public companies that have successfully increased their dividend payments for at least ten consecutive years. At the time of writing this article, there were 265 companies that achieved this milestone. With the right combination of metrics, this list is probably the best starting point to build your dividend growth portfolio or to find your next addition. As we start a new year, I’m fairly positive about the upcoming months. I believe 2018 will mark the 10th consecutive year of this bullish market. I’ve selected two companies from the Achievers list that should continue to reach higher levels this year. Hasbro (HAS) has found a niche for itself. The company has developed a few icon brand names such as Transformers, Nerf and Play-Doh, but Hasbro's real talent lies in licensing others' toys. Hasbro has now 2 impressive partners named Disney (DIS) and Activision Blizzard (ATVI). The first one enabled Hasbro to pursue consistent growth through Disney Princess, Marvel Super Heroes and Star Wars figurines. The latter kept Hasbro in the loop with a direct connection through video games. In 2017 Hasbro stock price has dropped by over 10% over a 3 month period due to concerns around future growth. After Hasbro published a strong quarter, shares fell immediately. Also, Toy's R Us raised some concerns about their financial situation. 60% of Hasbro revenues are in U.S. This leaves little room for currency volatility. On the other hand, it puts Hasbro in a strong position to benefit from the boost in U.S. consumer spending. While Hasbro has been on a great uptrend, the company is becoming more dependent on Disney’s future success. While Hasbro has offered steady dividend increases over the past years, its payout ratio remains under control at 45%. Since the company can count on many Star Wars and Marvels movies in the upcoming 5 years, you can expect strong dividend growth for this period. We expect a double-digit dividend growth rate for the next decade. A play on Hasbro is a play on the success of a proven formula. Without any surprise, each Super Heroes movie or Star Wars movie comes in as record breaking blockbusters. For each success, there will be tons of figurines and derivative products created. Hasbro excels in this industry and will likely have the lion shares of licences. Indeed, its licensing deal with Disney enables Hasbro to sell princesses and Frozen character figures. Not to mention the upcoming Frozen movie in 2018. Through its business with Disney, Hasbro has assured itself of strong revenues for the next five years at the very least. Hasbro will also benefit from two more Star Wars movies. It has been quite a roller coaster for Hasbro in 2017. After surging during the first half of the year, investors’ concerns around Toy’R’Us financial problems plummeted the stocks by 17% over the last 6 months. This probably created one of the best opportunities for dividend growth investors. I also used the DDM to determine a fair value for Hasbro. I’ve used a 10% dividend growth rate for the first 10 years as the company will continue to benefit from the wave created by Star Wars and Marvels movies. Then, I reduced the growth rate to 7.5% and used a 10% discount rate. Buy the stock on the dip, there is more than a 20% discount on this one. Texas Instruments is the world's largest analog chipmaker and a key supplier of embedded chips into a host of applications. For those who don’t know, analog chips are like translators; they convert real-world signals such as sound and temperature into digital signals that have the potential to be processed. The company is present in various segments with a strong focus on industrial and automotive sectors. The “other” segment now includes its famous calculators. Instead of simply building an army of engineers, Texas Instruments has also built an army of salesmen! Its marketing department is able to sell Texas Instruments technology to various industries. This brings additional revenues and fuels the R&D department with more cash flow than its peers. Through strong manufacturing expertise and economy of scale, the company has been able to expand its margins on a consistent basis. The personal electronics segment (26%) is more at risk. Chips for such devices evolve rapidly, and there is lots of competition. It used to be Texas Instruments biggest segment in 2013 (32% of sales), and it was down to a 2nd position at 26% three years later. Texas Instruments puts its energy in developing longer life cycle chips in the industrial and automotive sector. This looks like a good move for the long haul. Also, both industrial and automotive sectors are cyclical, and could hurt Texas Instruments fundamentals in a few years. But overall, there are not many catastrophes coming its way. 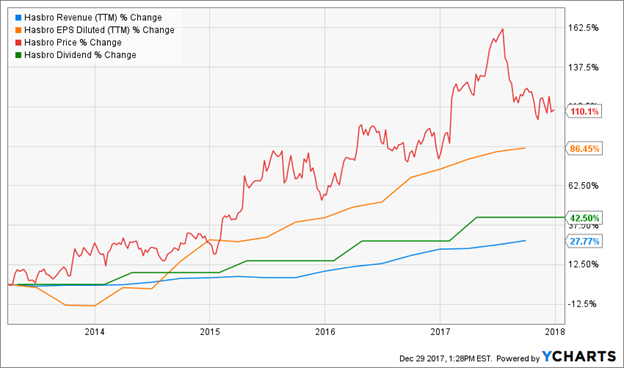 Texas Instruments is not only a long-time dividend grower; it also gained the mention of a super-powered dividend stock. Over the past five years, management increased its dividend by 195.2% for a 24.17% annualized rate. Management makes a clear focus on returning cash to its shareholders. Texas Instruments is a real cash generating machine. While its distributions rate skyrocketed, both payout and cash payouts remain under control. Texas Instruments has the size ($89 billion in market cap) to benefit from economies of scale, and stay ahead of the competition. While there isn’t much revenue growth over the past five years, the company’s future looks bright. Texas Instruments benefitted from a fragmented market to purchase many manufacturers at a low price, and consolidate its position in the analog chip business. With the rise of the Internet of Things, its chips will have the possibility of use in various other industries in the future. The company is also investing massively in R&D and its marketing sales team. It enables Texas Instruments to get more clients as its sales team is out in the field to push revenue to another level. In order to find Texas Instruments fair value, I use a double stage dividend discount model. Since Texas Instruments payout ratios are under 50% and the business is still booming, I expect management to keep a double-digit dividend growth policy for the next decade. I then reduced the growth rate at 7% to be more conservative. I also expect a return of 10% on my investment since Texas Instruments evolves in the technology sector. Please read the Dividend Discount Model limitations to understand my calculations fully. 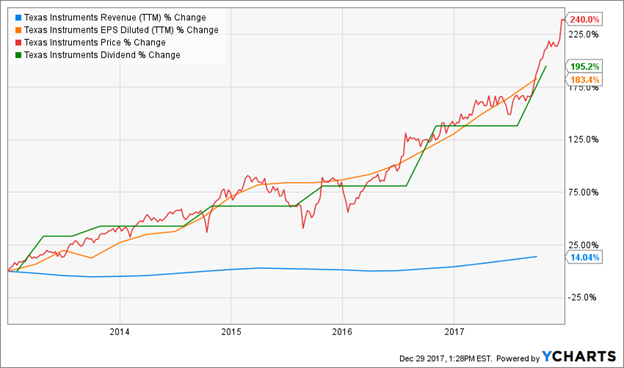 Even if Texas Instruments jumped by over 40% in 2017, there is still room for growth in 2018. It may be a great addition on dips, as lower prices translate into higher potential for dividends and total returns. I don’t know about you, but I appreciate when authors put their money where their mouth is. After all, there is little credibility to read positive articles on stocks when the author doesn’t even put a penny on them. I bought shares of Texas Instruments and Hasbro during 2017. So far, Texas Instruments (TXN) has been a great performer and I expect Hasbro (HAS) to post some solid after Holiday sales. I may be wrong and the market could go sideways. After all, this bull has to rest at one point. The good part is that I know that both Texas Instruments and Hasbro will continue to do well and raise their dividend even if the rest of the market slowdown.